Theremin Hero Greig Stewart is at it again, and this time he's released a highly stylized video demonstrating all the awesomeness that is Theremin Hero Air Guitar! The (highly) simplified version.. The sound from the theremin (or voltage output if available) is recorded live and captured by the software. The software then splits out the frequency and amplitude values and maps these to a virtual joystick, which has different 'hit areas' corresponding to the different buttons on a controller. The button presses are then fed into the game running on the same computer. 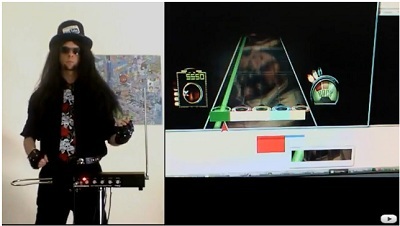 Greig has several other videos showing off his video game theremin playing skills as well as a website and blog. Be sure to check this out!